If you’re an avid gardener, then you know that the one thing that is the hardest to deal with is the collection of weeds that seems to pop up no matter what you do. Instead of plucking your garden’s weeds by hands, you should invest in an effective propane weed burner. What is a Propane Weed Burner Torch? A propane torch is something that will make de-weeding your garden a much faster process than it has been for you. When used correctly, you will find that weeding your garden is no longer something you dread, but something you take on enthusiastically. Never use propane torches on dry, brown plants or other flammable material. Water the soil in the area before you apply the propane torch heat. Hold torch steady while walking slowly between plants and targeting weeds. A killed weed will change from glossy to matte in texture and will wilt within a few hours. Flame weeds when they are younger as more mature plants requires more heat. Use your propane torch every 2-3 weeks. Tank Size: decide whether you want to use a propane torch that connects to a smaller propane tank which you will carry with you, or to a larger tank with which you will need an extension hose to reach your garden. Size of Burning Tip: you’ll decide whether you want a fine or wider flame depending on the area you intend to weed. Usually burning tips around ¾-1 ½ inches are suitable for home gardens. 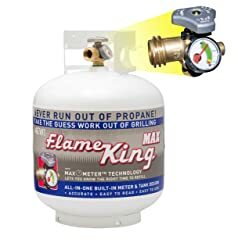 Burning Time: most propane torches include valves which let you decide how much fuel you want to burn in a certain amount of time with high and low settings. Easy Start: for the easiest operation look for propane torches with ignition switches. Price: there is a wide range of prices for propane weed burners depending on quality and features. Figure out your budget and remember that propane tanks must be bought separately. Now that you know more about propane weed burners and what to look for, it’s time for you to start examining different models to find the one that is right for you. 1. Red Dragon VT 2-23 C Weed Dragon 100,000-BTU Propane Vapor Torch Kit. A reliable propane torch made in the United States, the Red Dragon propane weed burner has received the National Home Gardening Club Member Tested Seal-of-Approval. For a reasonable price, you get a quality-made tool that you will use for years to come. Red Dragon’s propane torch can be hooked up to any refillable propane tank for your convenience, as it comes with hand-tighten tank fitting so it’s adjustable. Don’t worry about generating enough heat to kill your weeds, this torch can reach up to 2,000 degrees Fahrenheit. You’ll receive your propane torch fully assembled and be ready naturally kill your weeds right away. If you’ve started with the Bernzomatic UL100 Basic Propane Torch Kit, then you know the quality you’ll be getting with this outdoor torch. Flexibility and control are prime with the ability to adjust the valve depending on the size of flame you require for any given weeding job. Don’t stop with your weeds, though, this torch is multifunction and you can use it to light your barbecue, or even melt ice from your driveway. The torch extends to as long as 3-feet for easier reaching from awkward or tight spots. One of the best features of the Bernzomatic propane torch is its quick start that lights its flame with just a switch. For prime affordability, the Bernzomatic propane weed burner is a great starting choice for any home gardener. 3. Hot Max 500G Big Max 500,000 BTU Propane Torch. If you need a propane torch with a longer cord (10 feet), Hot Max is a great option for you. Reasonably priced, you will receive the ability to effectively and conveniently rid your garden of weeds. No need to worry about large areas, as Hot Max’s propane torch is made for just that. With the specially molded handle, you will notice that flaming your weeds is more comfortable than ever. The length of the handle saves your back a lot of pain since you won’t need to bend over in order to get the job done. Hook your Hot Max propane torch to any standard propane tank and you’re on your way. With the Greenwood propane torch, your weeds won’t stand a chance when you use the turbo blast to send extra heat their way. Just hook this torch up to a standard 20 pound propane tank and for a very affordable price, you’re in proper gardening business. You don’t need to worry about burning your hands as you weed because Greenwood provides you with a safe and insulated grip. The torch comes with a 6 ½ foot long cord, which may meet your needs, but if you need a longer one, simply hook it up to a simple extension cord to connect with your tank. 5. Harbor Freight Tools Propane Torch with Three Burners. If you’re looking for a propane torch that does not require a 20 pound propane tank, but rather uses a small bottle, then the Harbor Freight propane weed burner is the choice for you. A very reasonably priced investment for such a convenient propane torch, you will find that your value lasts for years. With 3 interchangeable burners, you’ll be able to use the Harbor Freight propane torch for more uses than you would imagine. 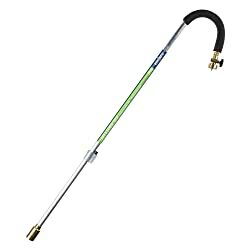 If you’re looking to get started using a propane torch to weed your garden, this one will suit your needs well. Make sure that you’re not caught with the propane torch in hand with the actual propane tank! If you have a propane torch that uses small bottles of propane, invest in a 3 pack of Standard Propane Fuel Cylinders from Bernzomatic so that you’ll have backups once you clear out your first batch of weeds from the garden. Each cylinder lasts quite a while so your weeds won’t be coming back any time soon! This 20 pound propane tank will last you a long time and through many refills, as it is protected with a long-lasted powder coating. With a built in gauge and protection device valve, you have all the elements you need in a propane tank. Pay a reasonable one time price for a sturdy, high grade steel welded propane tank you’ll refill numerous times. When you’re weeds start growing, the time has come to get rid of them. Put the days of weeding your garden by hand, and get yourself a reliable propane weed burner.